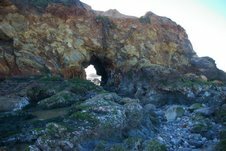 Some time ago I posted a story*** about what I consider the most viewed Sea Arch on the San Mateo coast. 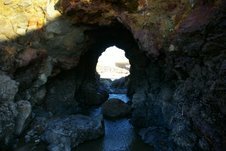 I maintained that this arch was the one on the promontory that forms the southern bank of Pescadero Creek where it flows into the ocean. There was some mention by someone that the arch was actually “a hand dug tunnel.” Curious, I went to look for myself, checked it out, took a lot of photographs and opined that it wasn’t regular enough to be manmade. Besides why would somebody go to the trouble of digging a seemingly pointless tunnel? 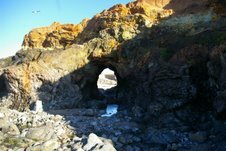 That Hole in the Wall is none other then the sea arch opening? tunnel? at Pescadero Beach. Only my neighbor informed me that he was sure it was a tunnel because in the Seventies the sides were much more regular, demonstrating its manmade origin. While I’m not one to question the hazy, thirty five- year- old memories of a drunken youth, I was still having trouble wrapping my mind around the idea of somebody going to the trouble of digging a tunnel in that spot. A few days ago while reading the transcript of a “Pescadero Oral History Project” interview with Ron Duarte, the owner of historic Duarte’s in Pescadero, I got my answer. Sort of. In another interview, also on the Pescadero Oral History CD, Marty McCormick was asked the same question. Interviewer: Do you remember the tunnel at the mouth of the creek? Marty McCormick: Out by the beach. Oh, yeah. It is still there. We used to crawl through there. There were some years where it was totally filled in with rock and then there were other years when you could go through there without having to do a belly crawl. I have pictures of my kids inside when they were pretty young—twenty-five, thirty years ago. They’ve convinced me. It’s a tunnel. 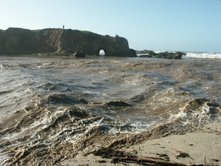 The battering surf has naturalized the opening over the decades. 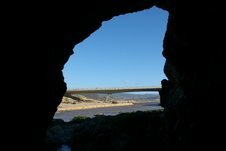 And while, to me, it seems obvious that a tunnel is as likely to sand up as the creek mouth itself, somebody, a long time ago, thought excavating one was a good enough idea to invest a lot of hard work. At least they’ve left us a durable monument to the futility of trying to make Mother Nature do our bidding. 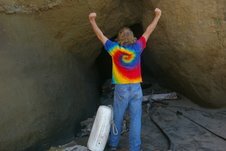 This entry was posted in John Vonderlin, Marty McCormick, Pescadero Oral History Project, Ron Duarte, South Coast Tunnels and tagged John Vonderlin. Bookmark the permalink.